Beautiful Incentives: FREE Crafts for kids. Eco-friendly, Green, Cheap and fun! FREE Crafts for kids. Eco-friendly, Green, Cheap and fun! Keep your kids and your wallet happy with some amazingly fun and easy recycled crafts! 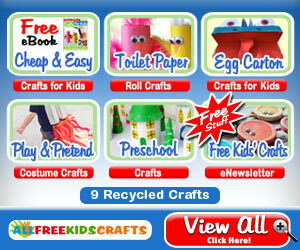 The Cheap and Easy Crafts for Kids: 9 Recycled Crafts eBook, brought to you by the editors of AllFreeKidsCrafts.com, is a collection of great, affordable ideas for craft projects the whole family can make and enjoy together. Families who craft together, stay together. Make toys, decorations, and gifts that will forever be wrapped in fond family memories with the inexpensive, "go green" craft projects from this free collection! Just sign up with your e-mail and get these crafts conveniently delivered to you! You can unsubscribe easily at any time!